Previous SDSOG Classified Ads -- These have all been SOLD! For less than the cost of a one day ad in the local newspaper, you can advertise your SAAB or SAAB parts and accessories here for three months! Contact Chris for details! 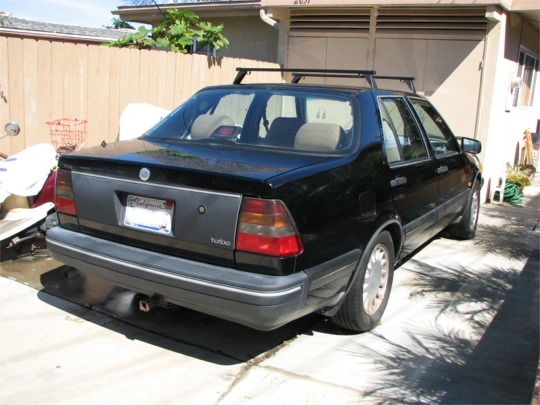 For other vehicles and parts prior to the Saab 900 model, check out the VSAAB Classifieds! 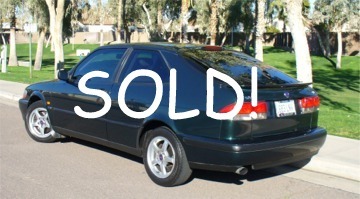 For a look at Saabs and parts that are currently for sale, click here. Rare black CD model in good shape with its HUGE trunk, 5-speed, very nice tan leather interior, decent dash with DashMat and only one small crack. Front seats and dash always covered for protection. Lifelong southern California car -- NO RUST. Full brake job 5K ago and motor mounts 3K ago. Body is very good except for one parking lot knock to the right rear "soft spot", sheet metal only, it might even pop out... photo below. Currently needs attention to a few of the most common 9000 maladies: headliner and door trim, headlight relay, AC, driver's window regulator and a clutch kit -- she's drivable, but will require a bit of work to get back to daily driver duty. Fires every time and runs very well, no idiot lights on, stereo works. 197K with lots of life left, just needs some love. Includes car cover, factory roof rails, original leather owner's kit and spare key. Paperwork is available for all repairs from 2007 on. Will pay for towing in southern California if needed. I really would like it to go to a good home. 190K, 2nd owner, California car in storage for the last six years. Car is complete with all receipts since 1980, currently in non-running condition with a bad fuel pump, last driven in 2008. New pump with rubber bellows is included with the car. Never in an accident, but has a couple of small dings in driver's door and right fender. Also some surface rust around the sunroof opening. Extras include roof-mounted ski rack with two bicycle racks, new fitted car cover purchased in 2013, rebuilt brake booster, new tires purchased before going into storage. 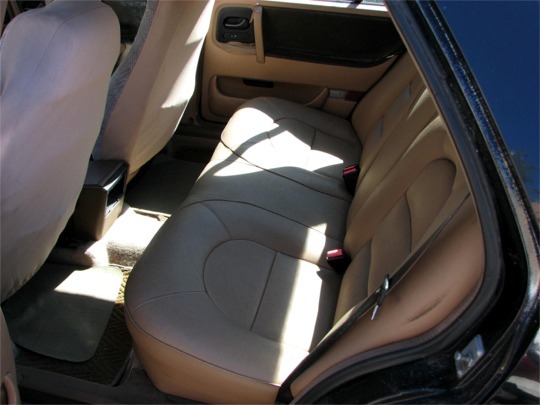 Battery is 3 years old, interior seats and carpets are original and in good condition. Please contact Kelly for more information. This Special Edition model is a rare example of the classic 900 convertible. I have too many SAABs: see ad for my 1974 Sonett III at VSAAB.com. Come visit and check out one of the finest remaining examples of this great car. Drive it anywhere; I can deliver for about half the cost of a commercial carrier. This 900 is black with a beautiful new factory convertible top with new rear window which was recently installed. Body, paint and engine are in excellent condition. 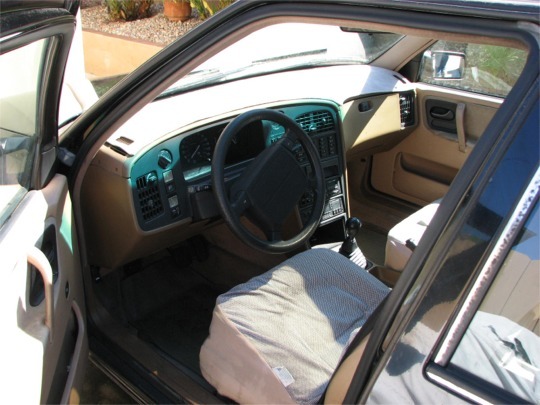 The beautiful leather interior is also in mint condition. The car has the original convertible 3-piece boot with carrying case. 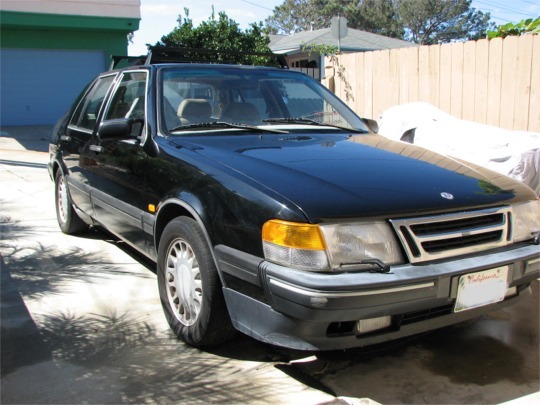 This car has been meticulously maintained by a Saab specialist and is a fine example of the classic Saab body style. The stereo is the original Clarion stereo with radio/ cassette and CD unit. The only reason for sale is due to relocation to the UK. 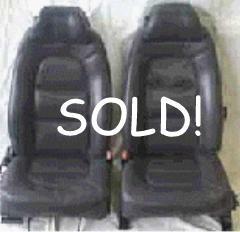 Excellent condition, black, manual transmission. 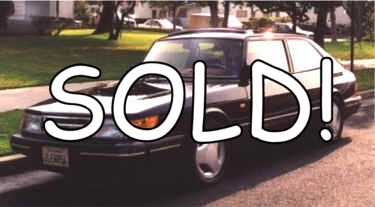 Black beauty 2-door hatchback in extraordinary shape inside and out, sunroof, clean tan cloth interior, dashboard almost like new, new CD player, seat height adjustment. Runs strong and firm, very nice body and unbelievably clean under the hood. 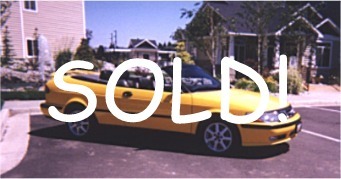 I'm only selling because I found a nice 1991 Turbo Convertible Special Edition and have three cars in the house now. Send e-mail or call for more nice pictures. Car fax report available also. Here's a must-see SPG in sunny Santa Monica! Swedish cars are made to last! Few repairs, totally reliable. Exceptionally clean inside and out. Master Saab tech Michael Straub from Saab of San Diego knows the car and can personally pre-sale check it for you. 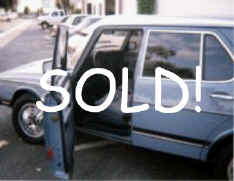 Blue book value = Good condition: $4,200, poor condition: $2,400 This one: US$2,995 ! Car is located very close to UCSD. 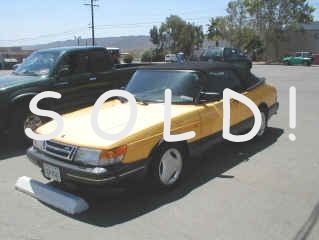 1991 SAAB 900 Turbo Convertible, Special Edition - Price Reduced! SPG appearance package, automatic, Monte Carlo yellow on black, 92k, RUNS AWESOME. 2.0L 4cyl 16 valve DOHC turbo engine, APC charge pressure control system, charge air intercooler, elec. fuel injection, front wheel drive, rack/pinion assist steering, 4 wheel power assist disc brakes, ABS, SRS with driver's side air bag, tinted glass all around, rear window demister, SAAB anti-corrosion treatment, dual power mirrors (heated), power top with full headliner, power windows (all), front fog lights, 8 way power front seats, leather interior, power central locks, AC, cruise control, alarm, 80w AM/FM stereo with cassette, 7 band equalizer, 4 speaker sound, auto antenna, rear spoiler, headlight wiper/washer system. 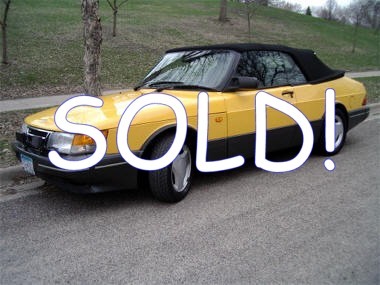 I bought this beauty in Washington DC in April 1998 from a Saab dealership. The first year I owned it I was in Japan and it was left in California where it was driven just enough. It's always been garaged has never seen an accident since I've owned it. The top was new when I bought it and still looks new. I believe they only made 300 of this model. 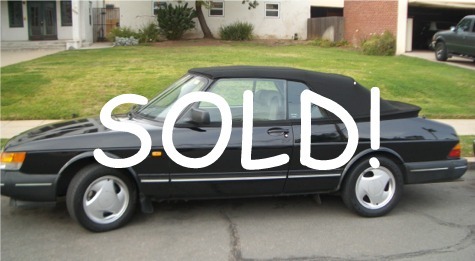 Since I bought the Saab, I've acquired a wife and two large dogs and I need a truck/SUV bad. US$12,000 $10,500 negotiable. Serious inquiries only, please. * New top and transmission! Must sell, I have 3 cars now! 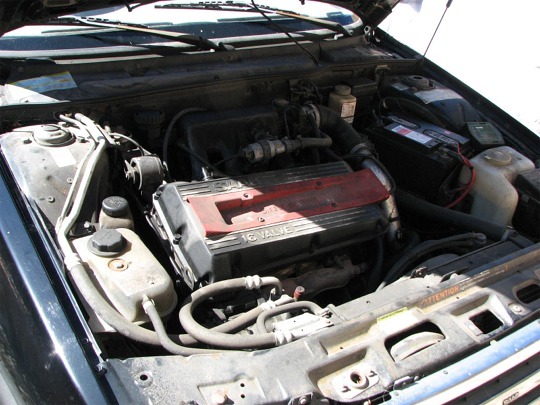 Transmission needs clutches and bands, otherwise this car is in excellent condition. Make me an offer -- I'm looking for a loving home for this car. Monte Carlo Yellow, pristine condition. Stored in winter. Saab stainless steel sport exhaust with c/f chrome tip, smoke directionals, painted front lip spoiler, painted rear deck spoiler, 16" BBS for Saab wheels with Michelin Pilots, CD and the works. I also have the unused original tires and wheels as well as a once-used Saab car cover. Only 17,890 miles! 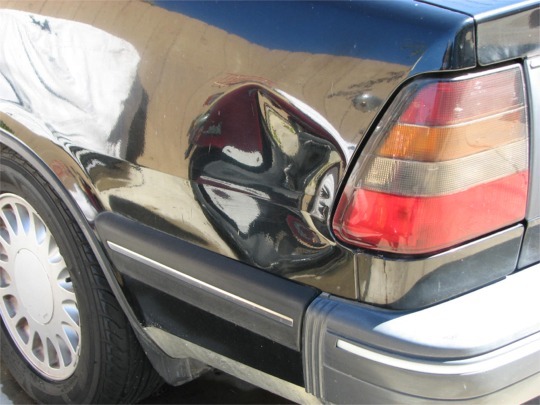 * Some collision damage on passenger side. On the Monterey Peninsula in California. Asking $550.00 plus shipping for the full set. No cracks, no sun bleach, definitely #10's. Best ones for $125.00, lesser ones for less - state your preference. Dash facia's for $69.00 or the two units together for $175.00 while they last! Prices + shipping. The San Diego SAAB Owner's Group cannot specifically endorse any of the products or services on this page. 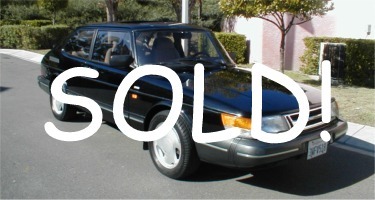 The San Diego SAAB Owner's Group is not affiliated with SAAB AB, SAAB Cars USA or any other organization. 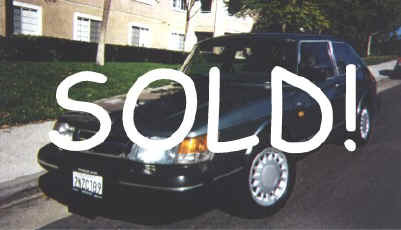 This site is �2003, San Diego SAAB Owners Group, all rights reserved.